This is a great recipe for using a bunch of our hen's eggs, and it turns out beautifully. It would make a wonderful and impressive brunch recipe, and it's really quite easy. This is a Taste of Home recipe. In a small skillet, saute the mushrooms in butter until tender; set aside. In large mixing bowl, beat the cream cheese, eggs, milk and baking mix just until combined. 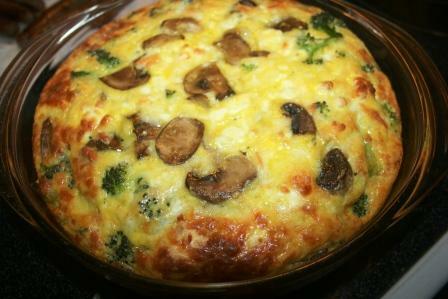 Stir in the broccoli, cheese, salt and mushrooms. Pour into a greased round 2 1/2 quart baking dish. Bake, uncovered, at 350* for 50-60 minutes or until a knife inserted in the center of the dish comes out clean. Let stand for 10 minutes before serving. Makes 6-8 servings. It does look scrumptious-it would be good for A Sunday brunch. My stomach just growled. A big bear growl! :-) I think I will give the recipe a try. It looks so good. Thanks! This, my friend, is almost too pretty to eat!! And easy! I just copied it and look forward to making it!! And I ordered the Big Al book and am getting the things for the porthole craft!!! This would be great for a brunch. How fabulous to have your own fresh eggs. Farm fresh eggs are so different from supermarket eggs. You are very lucky. This would make a great brunch and so easy too. Hope you and your family are having a wonderful Memorial day weekend. That sounds yummy! I'll have to make that!